10.30 am: Morning service led by Michael Howlett with Rev Kevin Jones, the Padre at the Vauxhall Barracks. Unfortunately Kevin’s microphone was not picked up in the recording; although the best efforts have been made to make his words as audible as possible in the recording, his words aren’t as clear as we would like. A transcript of the talk for all ages and the conversation between Michael and Kevin has therefore been provided below. Hymns have been removed from the recordings for copyright reasons. There are a couple of brief moments where the recording goes quiet; this is to cut out feedback. Michael: Do you wonder sometimes what men like our friend here carries around with him in his big sack? Would you like to find out? (to Kevin) Over to you! Kevin: It’s lovely to be here this morning. As you’ve heard, my name’s Kevin. I’m actually a United Reformed Church minister and have been for just over 23 years. 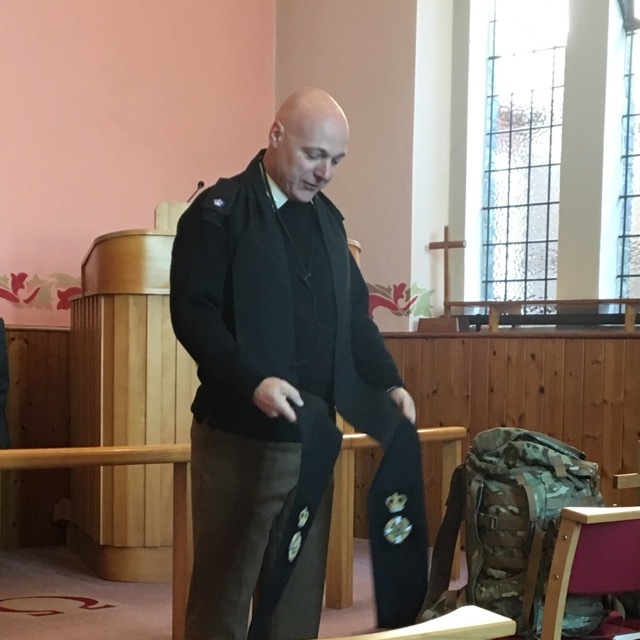 For the past five and a half years I’ve been serving as an army chaplain. And since February, I’ve been here in Didcot. I’m chaplain for the Eleventh Explosive Ordnance Disposal (Royal Logistics Corp) Regiment. But to everybody we’re just simply known mostly as Bomb Disposal. So although one squadron is here in Didcot (along with the support elements) we’re based all over the United Kingdom, including Northern Ireland, and also in Germany. And so we have fourteen different locations and I travel around the parish – it’s pretty big. I’ve got 721 soldiers, officers and soldiers, but also the families attached to them. And I’m their minister. But of course, it’s the army, so I’m called “padre”. My name for the past five years has simply been Padre. And probably if you asked my soldiers what my real name was, they wouldn’t know it even then. And so, travelling around, I’ve taken my cap off there, whenever you’re in the army you have what you call your day sack. You might call it a rucksack but we call it a day sack. And it’s important that it’s got on there who you are. So it says “Padre”. It’s says “B+” – now that’s not how well I did at school, that’s my blood group. It’s really important people know what your blood group was because, in case you got injured, they’d know what sort of blood to give you. Then that’s my ZAP number. “JO” because my surname is Jones, the first two letters of my surname; “2815” – that’s what we call “my last four” of my army number. Because in the army, you get given a number. So I’m 01342815. But, I don’t carry all the same things as other soldiers carry in their day sacks. So, what—there’s something really important that chaplains in the army don’t have, won’t ever carry. Does anybody know? What do you think that a minister of the church won’t have that soldiers would have? A gun – exactly right! Because we’re non-combatants; we don’t carry round weapons. Although we wear the army uniform, we’re there to support the soldiers to the army, so we never get involved in any fighting. We’re not there to help the army do their fighting, we’re there to care for the soldiers. 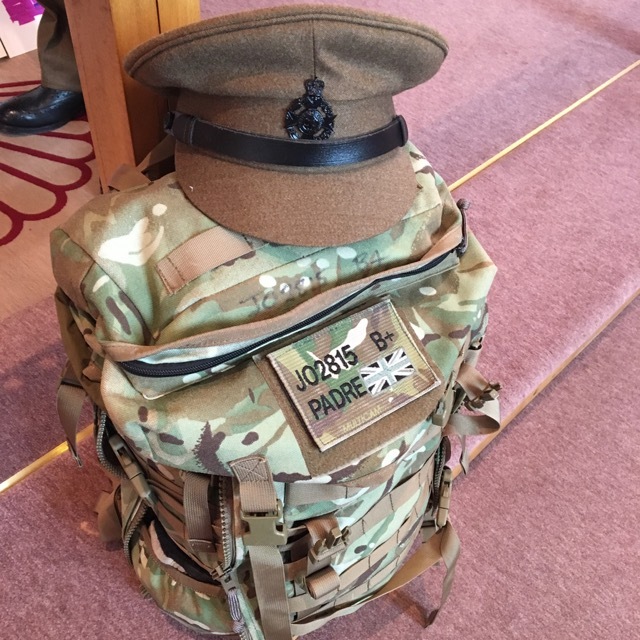 So I can take the church out wherever I am, whether it’s in another country, whether it’s out on exercise in this country in the field, I can bring church because I’ve got that part in my bag. If I’m bringing church, what’s a really important thing I’d need to have in this bag? Bible, yes. So in the top of here, I’ve got my padre things . So in here, I’ve got God’s word in the Bible; that’s important isn’t it? I’ve also got my preaching scarf. It’s not my proper one; because I carry it around with me in the field, it’s easy to wash it in case it gets dirty. Because the official one I’ve had is a silk one. So this one’s got a much more easily washable material for out in the field. So I’ve got that. I’ve also got something which I might wear sometimes to show that I’m a non-combatant. [Holds up a white band with a red cross] Although, I’ve never actually worn this because we wouldn’t wear those in Afghanistan. … But we would normally wear our red cross to show we’re non-combatants. Oh, and a little service book with some prayers and some hymns in it as well. So lots of different things. Also a head torch with spare batteries. All sorts of things in there. But I will show you one more thing. You’ve always got to have your food. And just in case you’re wondering – there, what do you think that is? Yes, it says on it “Tuna and pasta”. It’s – well, you wouldn’t want to eat it every day of the week, but it’s not too bad. So that’s just a few of the things that I’ve got in my day sack. But what I wanted to say really is that the most important thing about ministering in the army is that you’re involved with the soldiers. Wherever they go, you go too. So if they go out on an exercise in the field in this country, you go with them. So when my people who do bomb disposal – every six months they have to re-licence, they have prove that they can still do the job. So I go out with them and I go see them do the scenarios they’ve been given to do. They work with the police, the police call them in for a scenario, describe what’s happened, and they go through the task as if it was a real task. They even put on massive bomb suits sometimes, taking out robots with big arms to pick things up, and do all sorts of things that are a part of being in bomb disposal. So I go there. And I’ll talk a bit later in the service about what happens sadly when soldiers die, particularly if they’re not going to Afghanistan. The most important thing is that we’re there to be– to represent you, to represent the people of God, and to represent God himself. And so we’re there wherever they are; wherever the situation is, the chaplain would go there. Even if it was a dangerous place, a dirty place, a cold place or a very hot place – that’s where we would be, alongside them there. Michael: And I’m just glad that you have a pocket Bible and don’t have to carry that one around [points to the lectern] because I imageine your knees would start buckling! So, what do we learn from that? We’re not going to carry around everything with us, are we? A lot of what we carry around with us is either here [points to his heart] or here [points to his head], isn’t it? And that’s what we show to other people – what’s in our heart, or using our head for what we say to them. But it’s all the same: what you say, how you act, how you are. Michael: When I first offered to take this service in our autumn series on preaching on hope, this one “Hope in the face of death”, I confess that I wasn’t quite sure how I was going to tackle it. And then by chance or God’s good guidance, I met Rev Kevin Jones at Churches Together meeting – “Ah just the man!” Because if anybody has experience of trying to encourage people to have hope in the face of death, there’s your man. Welcome Kevin. Let’s start with your experience in Afghanistan because I believe you have a marvellous recollection of an Easter service. But also some of your folk have had problems with IEDs. Now I did look that up but perhaps you can explain. Kevin: Well in fact, I went on the summer tour, as we call it, of Afghanistan back in 2012. So I was out in Afghanistan from about March 2012 to October and I was there with the Welsh guards. And they in fact were doing the job, most of them were doing the job of mentoring the Afghan police – helping them with training. And they were travelling around all over the Helmand province and I was travelling around to see them. We also had two companies, that’s about 90 people doing what we called a ‘ground holding role’, a protection role, to protect people as the training went on. So when I arrived, strangely enough the army sent me out there on April fools’ day, the first of April, and it was just before Easter. And so when you get to Afghanistan, you’re required to do some initial training to acclimatise and to get used to things like making sure you’re aware of the potential danger of IEDs – Improvised Explosive Devices – because that’s where we know we’ve had a lot of both injuries and deaths. So as it came to Easter Day, a number of the Welsh guards were there ready to go out to their bases across Helmand, they said “Padre, will you do us an Easter service?” I said, “Well, there is an Easter service already.” They said, “Will you do us an Easter service?” And it really was in recognition of the fact that they were scared. They had just arrived, most of them had not been there before but going out into this role which they’d trained for, but was in many ways still going into the unknown. And obviously, with all the news stories and knowing about people coming back injured, and also being killed, they were – as any of us would be – scared. And they found that one place they could turn to was to the Padre, to the church. 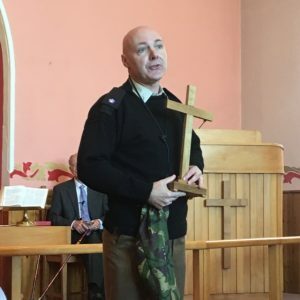 And so for a mixture of reasons – initially it was a few of them meant to come – I ended up with the tent, probably about half the size of this room here, absolutely rammed with soldiers, maybe 120, 130, people came along to that service. Because they simply wanted to hear, I believe, words of hope. Michael: It must have been a very precious time for you. Presumably from what you’re saying, there were believers and non-believers alike? Sadly as the tour went on we did lose soldiers in what we call ‘green on blues’, not through IEDs, but from rogue Afghan police who on two occasions shot guard soldiers. And so on the first occasion the guard soldiers had an RAF MP [military police] who was killed, simply by— Afghans had just turned up at the camp, nobody really knew them; and for some reason we never really discovered, from you to me Michael, one levelled a weapon and shot him dead. In some ways when people go out into a war zone, the whole thought of being killed in combat is something you’re prepared for – but not by the people you’re there to help. The rest of the Afghan police were absolutely distraught. They saw it as a terrible thing to happen, a great offence against their honour, because you know we were their guests. So we didn’t understand all the reasons why these things happened, but there’s a great sense of betrayal in those situations. Michael: Do you find it easier to support believers or non-believers, when they come to that point of death, threatened death, or death of somebody else, or are they all the same? Kevin: I suppose, in a sense, in the way I minister to people, I wouldn’t really differentiate in my own mind, but clearly from their perspective there’s a big difference between a person who has that belief that there is another life, there is a life to come, and somebody who thinks that this is all that there is. And so clearly it must have an impact on them. But in terms of trying to offer help, and particularly to be there to listen, they’re all mine. I see them as being all mine, no matter what their faith or non-faith. Again I think, because most of these people are very young, we’re talking about between– well, you can’t go into a combat zone until you’re eighteen, but the average ages is probably 23, 24, of soldiers out on operation. So they haven’t always necessarily worked out what they do believe. It’s a point of crisis when they explore what they do believe about life and death. Michael: Yes, somewhat younger than probably most of us here. Kevin: Yes, I’m the odd one in the army. I’m 53 and there’s nobody in my unit who’s older than me. Michael: When a soldier is killed, it obviously affects their comrades. Do they just come to you anyway, or do you take stock of the situation to gather the close group together to talk things through with them? Kevin: It’s not just down to the padre; the army tries to exercise care in various ways. Although, on operations, I suppose I would be the main effort. Back in this country we have welfare teams but they don’t deploy, they don’t go on operations. But we also have a system of peer-to-peer care. We have a system called TRIM and people are trained to be TRIM practitioners. And so they’re people from the ranks. And TRIM stands for Trauma RIsk Management. So there’s a whole system where soldiers have to be seen within 48 hours of a traumatic episode by – normally for a group of those who’ve been affected, there’s somebody who’s been trained to listen to them. And often what will happen then, is that the TRIM person will then, if they’re particularly concerned about people, refer them to the padre, and sometimes to medical care as well. Because also we have a big mental health team and they do come on operations a well. They work very closely with the chaplains. Clearly everybody’s affected but, I would particularly be making sure that I’ve got that group of people who’ve lost their comrade together to do some reflection. One of the very therapeutic things that happens for soldiers is that after a death they’re asked to write something about the person who’s died. And those things get passed to the family. So they sit and think about that person and what they meant to them – and that’s very helpful as well in terms of valuing their life that’s gone. And then for me, I would want an act of worship to gather them together and to reflect on, again, the person who’s died, and then offer words of hope, prayers and Bible readings – in a way which is appropriate to them. Kevin: Across the military, there’s only been a couple of years, I think, since the Second World War when we’ve lost more people in operations, in combat, than we have through other causes. And the biggest cause is road traffic accidents. I think it was only in 2001 and 2010 that we had more losses in Afghanistan than we did from other deaths. Sadly, because of the age group of the people we’re talking about, there’s also people who take their own lives as well. And that may be to do with—well, people will have heard of PTSD (post traumatic stress disorder)—but also to do with the fact that people in that age group often suffer from depression and mental illness. And that affects them, whether the cause is to do with being in the military or simply being part of our society where mental health and illnesses are a big issue for us. So yes, I’ve dealt with those situations as well. Michael: I do wonder if there’s a lesson for us as a church, a Christian community. I don’t know how well the soldiers know each other, or the officers know the soldiers, but obviously they’re in close proximity all the time – living cheek by jowl with all their comrades, their mates. But of course, I have to say this, that sometimes in church life, we know people because they’re sitting there on a Sunday, but we don’t necessarily know what’s going on during the week, or what stresses and strains they’re under. Kevin: I know, it’s a big thing where there is a massive bond. It’s a natural thing where you spend time both on exercise together – where you’re eating, living, sleeping together – and obviously on operations where, for the whole six months, you’re all together and usually with the same people in a small environment, probably sharing the same tent and everything you do is done together. So people get to know each other very quickly and very, very well. And they know a lot about their background and their circumstances, yes. Michael: If you are able to do so without breaking confidences, or perhaps give another name, is there anyone you can think of that hasn’t just been helped through a time of death for whatever reason, but has become stronger in their faith because of – well I presume not just you — the way they have been supported. And the passage I had used was Ecclesiastes 3, ‘for everything there is a season under heaven’ and includes the words ‘a time to be born and a time to die, a time to plant and a time to uproot.’ But that scripture had spoken to him. And he couldn’t say what it was, but that just… he really wanted to know. Somebody who’d not really been to church before – those words helped him and made a big impact on him. And he wanted to have a copy of it himself. And it’s at those times you think, well, would I have thought that? I would have thought maybe another piece of scripture would have helped, something about heaven, but no, it was that passage that spoke to him. Michael: And isn’t this true of every time that any one of us tries to help, not necessarily with a death, but whatever might be happening in their lives, it’s not just us – we’re doing it with God. We’re seeking God’s Spirit to work through us to that other person. And it’s not just being a friend – that’s important – it’s not just giving physical help (a touch of the shoulder, or a handshake, or whatever it is, that’s important), but it’s also what happens in our encounter with each other where God is working through the situation. And I think that’s hope in the face of death. We have tremendous hope don’t we? Our Lord himself was killed, but that wasn’t the end. Yes. Thank you, Kevin. I’ve really appreciated being able to work with you on this and listen to some of the, not stories, but experiences that you have had. And whether those experiences are echoed in any one of us, I’ve no idea. But I’ve learned a lot.